I have always loved the movie "Big", but the Zoltar machine featured in the movie always creeped me out. 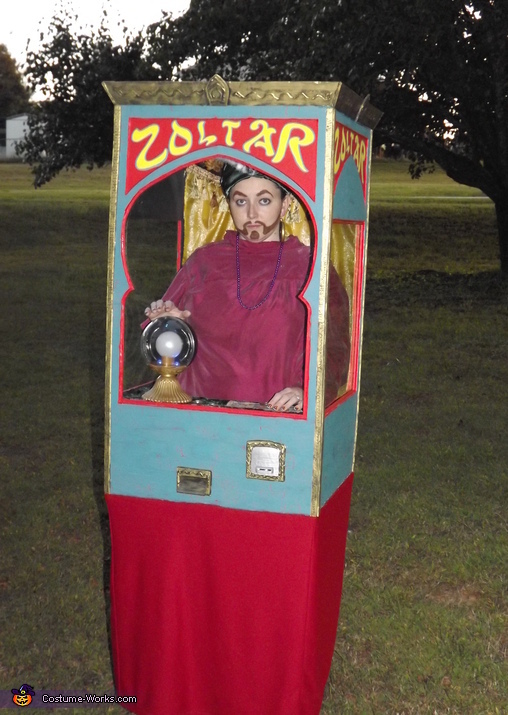 Each year I try to make my costumes more unique and detailed, so I thought I'd be a Zoltar machine this year. I only spent around $25 for my entire costume. Most of it is made from recycled materials and thrift store finds. The main part is constructed from a cardboard box and foam poster boards. I used all kinds of other materials including hot glue, latex caulk, crackling medium, paints, fabric trim, plexiglass, and various fabrics. There is a coin slot and there is also a slot where I can actually drop a fortune card from the inside and it will pop out the front for people to retrieve. A voice box and speaker allows me to speak with people so it sounds like an actual electronic arcade machine. The crystal ball (also found in a thrift shop) lights up and there are also lights to illuminate the inside, so it looks like an arcade machine lit up. I attached a belt and straps to the back of the costume, so I carry it on me like a backpack. Overall, I think it's a unique, interactive costume and I was able to create this a lot cheaper than I could have bought a store-bought costume. Zoltar says, "Have a Happy Halloween!"